On my way through the neighborhood this morning, I saw kiddos waiting on the bus while parents eagerly waited with them. This is a sure sign summer is over for some. In the food world, this may be true as well, according to Pinterest. But I continue to see juicy produce like watermelon, heirloom tomatoes, basil, dill, pickling cukes, summer squash, corn, blackberries, blueberries, oh and apples just started arriving, at the farm and market. I’m resisting the pressure (insert teeth grinding emoji). So I’ll forge ahead as if I have my head in the sand, or something. Because as long as Summertime produce is available locally, I’ll let that guide my food choices. It really is still Summer, after all and I’d yet to make a blueberry crisp! That’s not to say we’ve had a change here in the Pacific Northwest, we have. Cool breezes, rain, our feathered friends starting to head South. How’s it in your part of the world? There’s a bakery in Seattle I like to stop by when I’m in the city. I make it a point to try something new each time I go. On my last trip I had a blueberry cornmeal mini snack cake that was, well, um, one of my favorite. things. ever. But I say that about a lot of food. So for the sake of gushing, you know I have a problem with that, I’ll just tell you that I’ve been wanting to recreate it. Then I get distracted with, whatever. A friend gave me the bakery’s cookbook a few months ago. I tore the book apart searching for the mini snack cake recipe, which isn’t there. But what I did find was something with comparable flavors I used as the base for this Blueberry Lemon-Thyme Cornmeal Crisp. The mini cake is to be continued, and hopefully I’ll have something for you next Summer. In the meantime, this crisp and my other motivation for sharing it with y’all. What I love about crisps are their versatility, ease and how they can be made quickly, stored in the fridge and popped in the oven as dinner is served. When you’re sure you can’t wait anymore because its sweet aroma is wafting through the house, it comes out of the oven piping hot, ready to receive its scoop(s) of vanilla bean ice cream. If you prefer, marionberry or blackberry would be fabulous in this recipe. I’m partial to blueberry, especially because cornmeal and blueberry pair so well together. For the topping I use oat flour, whole oats and cornmeal with a bit of sugar, butter, lemon and fresh thyme. I’m thinking fresh rosemary would be quite tasty too in this blueberry crisp, when thyme is no longer in season. 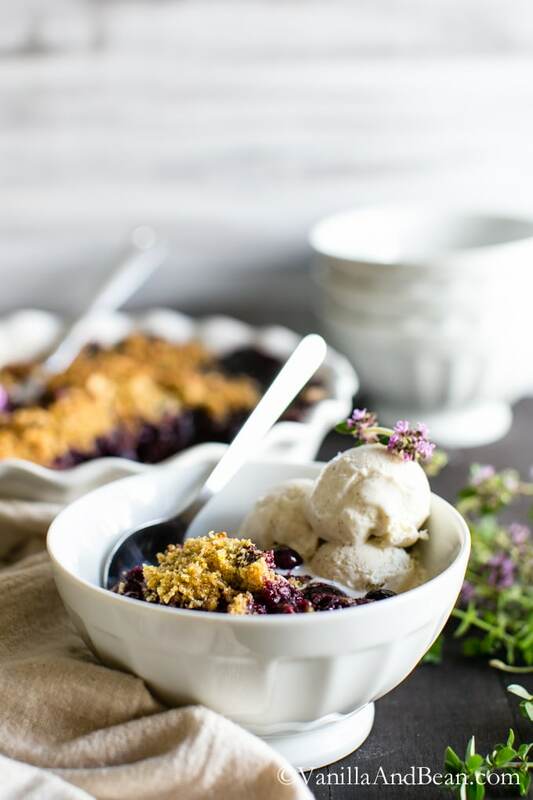 Serving this easy blueberry crisp recipe with vanilla bean ice cream is a must. When the cold ice cream hits the warm blueberries, it turns into melty, rich and sweet goodness that will flip you out. Not kidding. The extremes of cold and hot, crunch and creamy, sweet and a bit of tart is the pinnacle of pastry and your mouth will thank you. Use 1 Tbs of butter to coat the bottom and sides of desired baking dish. Use an 8x8, 4-10 oz ramekins or 9" deep dish pie plate. If baking in ramekins, line a sheet pan with parchment and bake on the parchment paper as the fruit tends to bubble over. In a mixing bowl, add the rolled oats, oat flour, corn meal, and sugar. Whisk together. Add the butter cubes and cut in until the mixture looks mealy. There will still be some larger chunks of butter. This is okay. Add the lemon zest, thyme and extract. Stir. The mixture will be crumbly. Rest in fridge while assembling the remaining ingredients. Toss the blueberries with lemon juice and maple syrup if desired. I typically do not use maple syrup due to the sweetness of the berries. If your berries seem tart, you may opt to add the syrup. Pour the berries into the prepared baking dish. Pour the crumb mixture over the top and spread evenly. Bake the crisp for 50 minutes or until fruit is bubbly and top is golden. If you prefer a darker top, turn your oven up to broil and broil for 1-2 minutes. Watch the crisp carefully as browning will happen fast. Allow crisp to cool slightly before serving. Delicious served with a scoop of vanilla bean ice cream. Store in a lidded container in the fridge for up to three days. Re-warm at 350F for 10 minutes. * To make oat flour, toss oats in a food processor or high speed blender and process until a fine meal is formed. **To make this crisp vegan, omit the salt and use a dairy free/vegan friendly butter such as Earth Balance butter instead of dairy butter. Recipe inspired by Dahlia Bakery. This recipe looks yummy, except I can’t eat dairy. Do you have any suggestions for a topping that doesn’t use butter? Hi Donna! You could use EarthBalance vegan butter or, although I’ve not tried it, you could try coconut oil (so I’m not sure if there’s a 1:1 replacement for butter). If you use coconut oil, measure it out then melt it and whisk in a Tbs of water before adding it to the dry ingredients. I hope this helps. Do you think this would be with peaches instead? Hey Heather! Thank you for your note. According to the Flavor Bible, Peaches and Corn don’t really ‘go’ together (but I’ve not tried pairing the two – so I’m not sure). If you do give it a go, try subbing oat flour for the corn meal. I hope this helps. I’m ready for all things pumpkin but at the same time, I don’t want to say goodbye to the delicious summer produce. I love the flavor of blueberries with cornmeal. I’ve had blueberry cornbread and it’s so good! This blueberry cornmeal crisp would be great for an afternoon snack! oh my GOODNESS! Traci, this looks absolutely scrumptious! 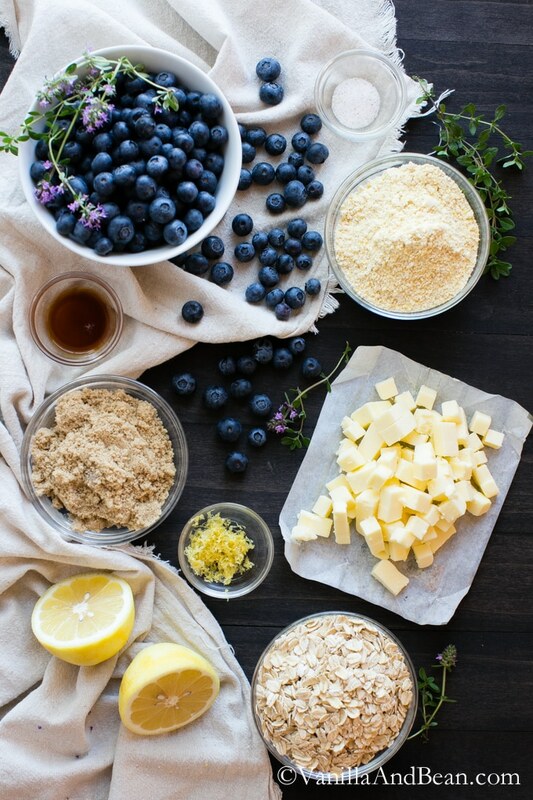 The blueberries look like perfection, and your photos are simply stunning! I live in Australia, so it is actually just the beginning of spring here, which i always look forward to :) but yes, when summer is withering away, i always find myself clinging to the last bits of it and having slight separation anxiety lol! i’ll bookmark this amazing combo for when blueberries are abundant here :) love it! This is beautiful Traci! Your photos are always stunning..
Traci – I mean, just look at those beautiful pictures and you instantly want to make this beautiful dish, Traci! I am also constantly debating whether I want fall to be here soon or if I still want to wear shorts and flip flips everyday to soak up as much of the sun if I could. I also live in the northern part of my country (Germany) where the days are starting to get a lot shorter quickly. This is definitely something that I need to try soon before summer is over. I love September, you can still see a lot of summery and colorful recipes and also a nice mix and balance of fall recipes, the perfect of both worlds. I saw this crisp on facebook first and shared right away, such goodness served with ice cream is a must try. Awh, Sarah, thank you my dear and for your pin! As much as I understand why you do not want to let summer go, I have to tell you- I miss the crisp mornings and cool afternoons of the fall. Living on a Caribbean island, where it is almost always 75+ degrees made me appreciate the seasons. And believe me, if you had told me that I will be writing this 5 years ago. I would laugh at you.. But… Oh well.. We all change, don’t we? Sending you lots of (and never ending) sunshine.. Cheers! Wow, beautiful photos. I am Japanese live in Australia and did not know the combination of corn meal and blueberries. Sounds very delicious combination that I must try. Hi Shihoko! Thank you for stopping by! I don’t see the combination very often either, but once I had it, I knew I had to incorporate it into more recipes. I absolutely adore the surprising combination. I hope you enjoy the recipe! LOVE THIS, Traci. As I was putting together the links for the shower, I saw yours and thought ‘she’s too good.’ The pictures make me want to dive right in! Well autumn might be fast approaching but the temperatures here in Boston still say summer. As a matter of fact, it always seems to be the hottest in September. Lucky for us summer produce is still readily available and we can gorge on it knowing that it will soon be a distant memory. 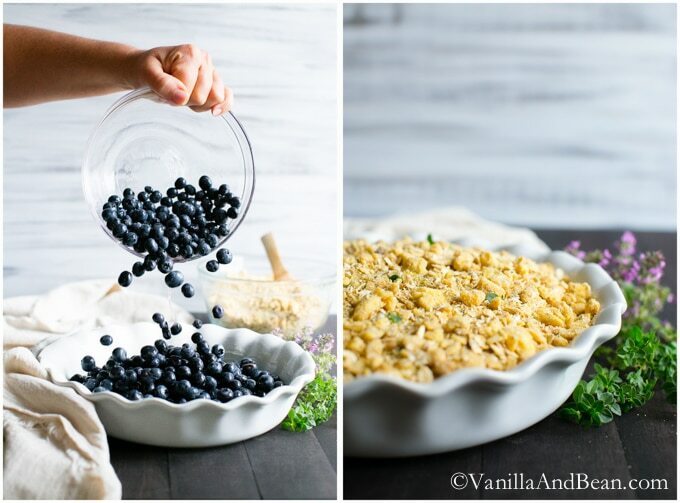 I always find that blueberries are easy to come by regardless of the time of year & this crisp is the perfect way to celebrate those blueberries. BTW. . .awesome job capturing the steam from the piping hot crisp. Looking at this photo I could practically smell this fruity delight. Your pictures always amaze me Traci! This crisp has two of my favourite ingredients – blueberries and lemon! It’s so beautiful! I hear ya! While I am excited for fall and all that it has to offer… I will continue to enjoy the rest of summer for as long as I possibly can lol! Pretty soon it will be October and there will be no looking back lol… might as well make the most of this! BTW, this looks SO beautiful!! Seriously, your pictures are priceless! SUCH a lovely photographer you are! This combination of ingredients is absolutely delightful Traci! What a beautiful way of embracing summer. This looks amazing! Yes, I would say that topping it with vanilla bean ice cream right after it comes out of the oven is a definite requirement. I bet the thyme paired with the lemon and blueberry is absolutely delicious! Tracy this is so beautiful. We’re having friends from out of town this weekend and I will absolutely be recreating this for them. Haha, Michelle, I had to give 1/2 of it away so I wouldn’t eat it all. It’s a great way to round out the last month of Summer blogging for sure! Traci, this Crisp! Oh my, I am loving it! 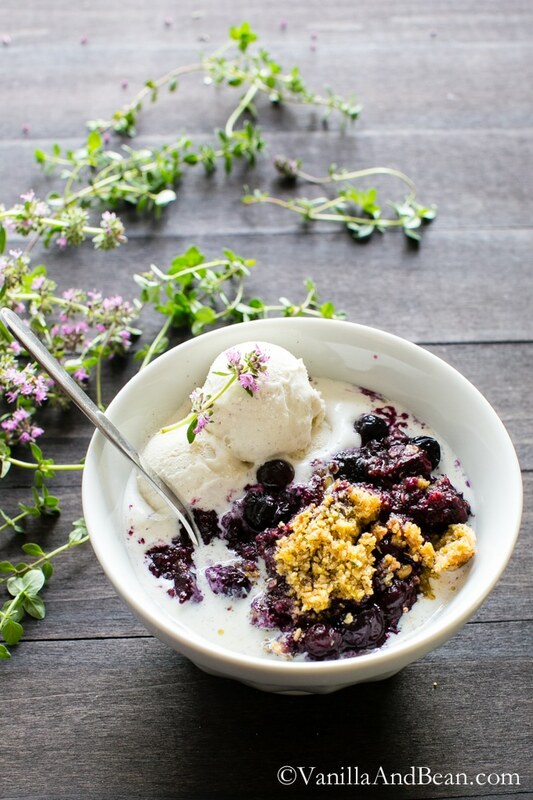 The combination of cornmeal, blueberries, thyme, vanilla bean ice cream…I can’t take it! I wish that bowl was right in front of me!! What a perfect way to hold on to summer! I’m not letting go!! Your photos are just gorgeous! Thanks for sharing!! Your photography is magazine worthy! Seriously stunning! You’ve blown us all out the park with this recipe! Bob and I are in NC at the beach, bodysurfing and kayaking in the sun! It is most definitely still summer here! Maybe not so much back home in NY. 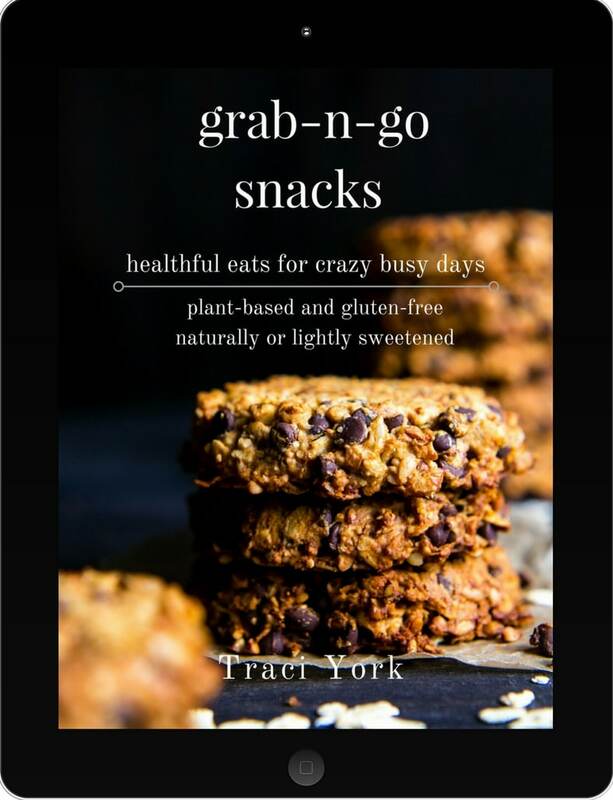 But seriously, Traci, I didn’t think it was possible for your blog to get even more gorgeous and delicious! You just dazzle! I could not be more with you Traci! It is STILL summer. I STILL have fresh corn, a plethora of fruits and heirloom tomatoes at the markets… this means I will CONTINUE to cook and devour these things. I WILL hold on to every last juicy morsel of summer… until the VERY end! :) Besides, I still have butterflies elegantly making their presence in my back yard. SUMMER. Of course you do, Cheyanne! All that fabulous produces that surrounds your abode… we’ll just keep on going, resisting those fabulous Fall flavors for a bit longer! No doubt the butterflies are still hanging out here too. I’ll be missing them soon. Oh Pinterest. Such a love-hate relationship. I’m so glad you are holding onto summer and cooking with what’s still in the stores. Because I certainly am not seeing any pumpkins around. Still lots of berries, melons, corn and basil to be purchased and consumed. So I’m sticking with that as long as possible! Gorgeous crisp. I love the combo of blueberries and thyme! Traci!! Not only is this virtual baby shower so incredibly sweet, but I am blown away by this recipe.. You are such an intensely incredible photographer it almost hurts me to look at your work. And blueberry + lemon + thyme?! 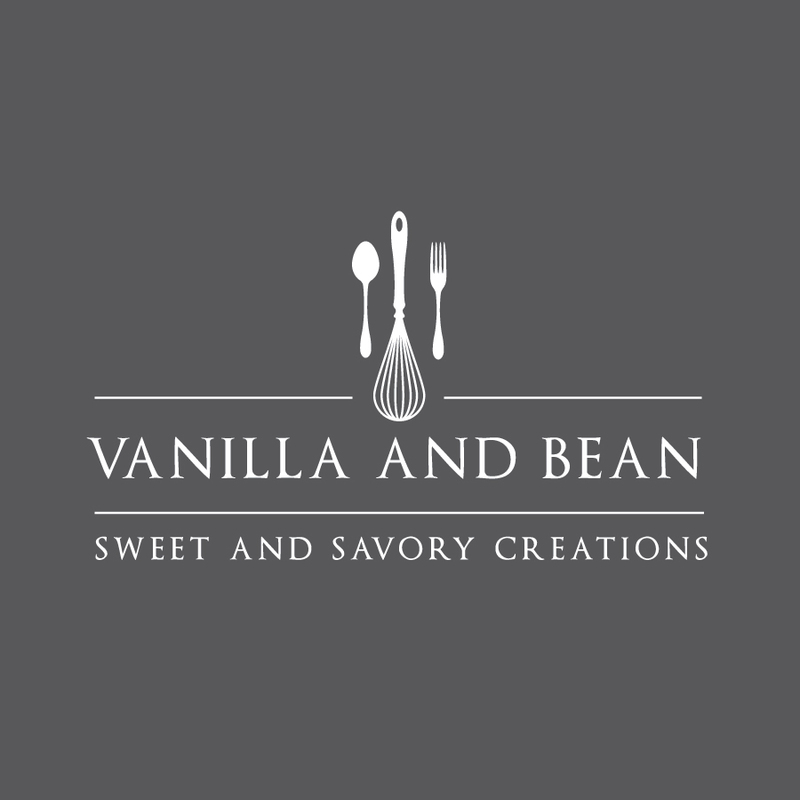 That’s trademark Vanilla and Bean rustic elegance right there. I am so, so grateful to be part of such an awesome community and be surrounded by so much talent, and I can’t wait to thrust Leo right into the mix! Thank you for being part of the shower :) I totally teared up when I saw everything! Damn pregnancy hormones..
It’s still full on summer here in Los Angeles. We’re heading into another heat wave next week so this would be the perfect easy dessert to make. 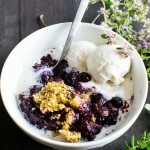 Love the blueberry lemon thyme combo – and of course a big scoop of vanilla ice cream just takes it to the next level! Thanks, Traci! Oh, the Summer is still going strong for you Geraldine! Oh my, another!? Are you ready for it to be over? I agree, a BIG scoop is a must! I can never stop into Dahlia bakery without buying at least two different sweets. 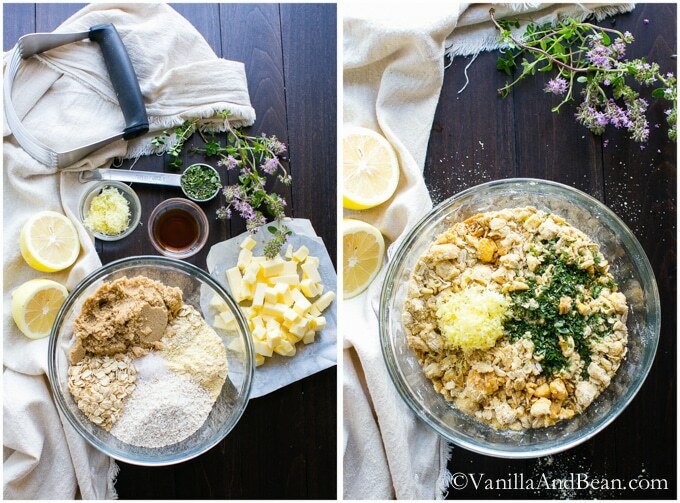 I’m excited to make this lemon thyme crisp, the flavors sounds divine. Pinned! It is still summer, and this crisp is gorgeous. Love the blueberry/cornmeal/thyme flavors. (I’m putting thyme in everything for as long as I can!) Thanks for sharing this recipe, Traci!!! Summer isn’t over yet for me, too! This crisp looks perfect Traci! And I also have the Dahlia Bakery book and love it! Great inspiration. So happy for Cheryl, too! Pinned! Hooray! I’m still cookin up a Summer storm! Thank you, Mira and for your pin! Fabulous book, eh?